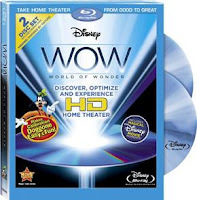 In this post we will discuss about surround sound where I will introduce you to various tools available for calibration of audio as well as video devices at home. 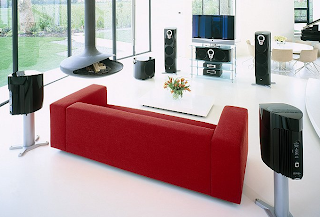 Those who are familiar with acoustics know no two rooms sound alike and even if you use the same AVR and speakers. 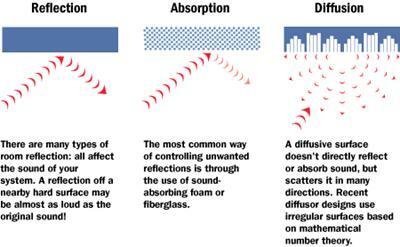 Sounds can get reflected, absorbed or diffuse by various materials present in the room. 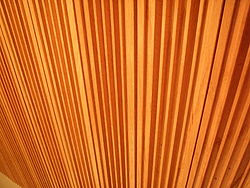 Sound waves gets reflected from walls, floor and ceilings and even furniture, so that what you hear is a mix of direct and reflected sounds which reinforces some of the frequencies and dampen some other frequencies. It causes distortion resulting in muddy bass, degraded high frequencies and surround envelopment. There are ways to reduce the reflection using sound absorbing materials called acoustic boards fixed on the walls or using carpets you can reduce the sound reflected from the floor. But still you need to compensate for the acoustic peculiarities of the room by boosting or bucking some of the frequencies. 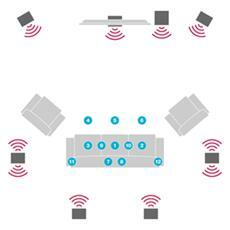 Audyssey may be the most versatile and popular Audio calibration system around. Its automated speaker set-up and calibration measures your room first and then sets your system for optimal sound throughout the room. It determines the crossover frequencies among your speakers and the level of sound amplification or attenuation required for different frequencies for an optimal and faithful reproduction of the original sound. Calibration using Audyssey MultiEq is much easier, faster and more accurate than any manual equalization that simply sets speaker levels. There are four variations of Audyssey starting from very simple 2EQ to the most advanced and complex MultEQ XT32. 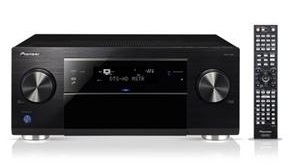 You may find one of these technologies in your AVR from Denon / Onkyo depending on the DSP processing power available which translates to the cost too. It is the newest and most accurate room correction solution with more than ten thousand individual control points allowing finer details of the room’s problems to be captured and corrected. The ultra-high resolution filters are applied to all channels including the subwoofers, with the most obvious benefit being heard in the low frequency range where correction is needed the most. This is an advanced resolution room correction solution with high resolution equalization filters for satellites and subwoofers. Most products with MultEQ XT are installer-ready and can be calibrated by an Audyssey Registered Installer to provide even higher performance for even the most demanding large or odd-shaped rooms. It is the most common resolution room correction solution that uses mid-level resolution filters for satellites and subwoofers. It is the basic resolution room correction solution that uses basic resolution filters for the satellites, but does not apply a filter to the subwoofers. How to calibrate using MultEQ? 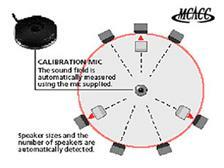 When you unpack the box, you'll find a calibration microphone attached to a very long cable. This has to be connected to the “setup mic” jack and when you plug the microphone into the jack specifically designed for it on the receiver, the calibration tools start up automatically. Just follow the instructions on your HDTV, one step at a time. The first step is to place the microphone at the number one listening location, at roughly the height of the head. Then just follow the instructions for every position. The receiver generates a set of sweep tones, one speaker at a time. The sweeps happen very fast, so you hear them as a series of loud whooping sounds. The microphone captures the tones, and feeds them back to the receiver. After all of the speakers have completed their tests, the DSP inside the system spends some time crunching the data. Eventually, at the other end, the system spits out the crossover frequency for the subwoofer and calculates the distance from the speaker to the listening position. You need to repeat this for various positions as guided by the information on the screen. This will enable you to fine tune the system for best performance. 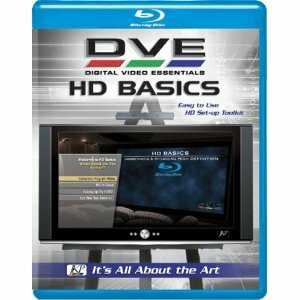 Please go through the link http://www.audyssey.com/audio-technology/multeq/how-to for more detailed information. While doing this important step of configuration one thing you need to keep in mind that set your front speakers as “small” even if it is a large floor standing one. Otherwise no bass will be directed to the subwoofers. MCACC is from Pioneer and got lot attention due to its hot AVR LX55. LX-75 and LX85 series of AVRs which are top rated currently and ideal solution if you have an iPad or iPhone. The entire setup and control of VSX-LX55 can be made using an iPad which is much easier compared to others in the market. Pioneer comes with MCACC for audio calibration. It's an automatic sound field adjustment system that enables you to precision-tune your system to your living room, just like a sound professional, but with minimum effort. A microphone monitors the sound environment and an equaliser (either 5 or 9-band, depending on which model of amplifier you have) optimally adjusts the sound parameters. The result sounds like a professional recording engineer has fine-tuned your amplifier or home cinema system. MCACC was created as a joint effort between Pioneer and professional sound engineers at AIR Studios. It may not have all the minute controls like Audyssey MutEQXT 32 but it allows lots of manual tweaking unlike Audyssey so professionals like it. My Subwoofer sounds very ineffective. Why? This issue will be compounded for a square room. 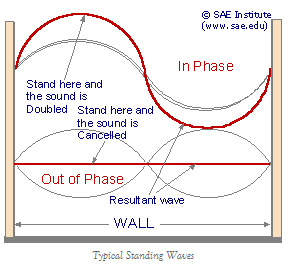 For a room 11’X11” the calculation gives that standing wave is at 51Hz so the bass will be seriously affected since you have an issue around 50Hz and its multiples, 100Hz, 150Hz, 200Hz. To reduce the effects of this issue better to use non reflective material in the wall and use carpet for the flooring and false ceiling may help. Fortunately you need not much of the theory behind it, there are plenty of tools available in the market (http://www.amazon.com/) , grab one of them.